I feel like the Carpenter song today... It's cold and drizzly. It's Monday morning. I just want to snuggle in bed all day. And watch movies. And eat popcorn with M & Ms. But... I must rally. Too much to do! I must get sewing. I have lots of aprons to make...to sell in an upcoming boutique...that my dear Sister W asked me to participate in. Valentines are in need of making. Run my little munchkins around. Teach a class this afternoon. 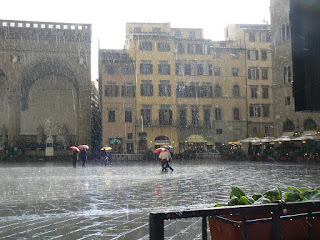 PS - The above picture was taken by me...while I was sitting under an umbrella...at a cafe...sipping red wine...with the love of my life...in Florence. LOVE the picture. that is awesome. can't wait to see your goodies! !